You are setting up the Forefront Identity Manager (FIM) 2010 R2 Azure Active Directory (AAD) connector. 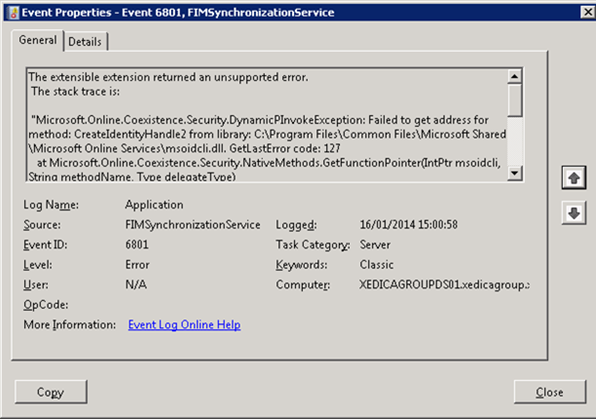 The extensible extension returned an unsupported error. Simple solution. The version of the AAD connector has a dependency on the Azure Active Directory Sign-in Assistant, a.k.a. Microsoft Online Services Sign-in Assistant, version 7.250.4551.0 or later. Download and install the AAD sign-in assistant and install. It will install over the top of an existing installation without the need to uninstall first. I was mistakenly running 7.250.4303.0 on a server that I recovered FIM onto and thus hit this issue. Almost not worth posting this but we managed to hit this issue more than once in a very short space of times when setting up development labs this month and last month so the older client is still readily available therefore I think there’s some value in this post. 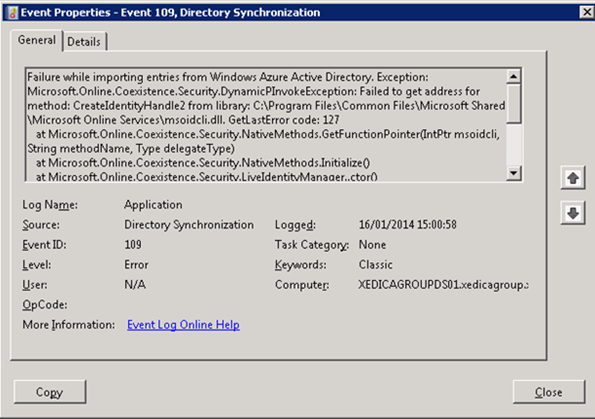 This entry was posted in Azure Active Directory, DirSync, FIM 2010 R2, Troubleshooting and tagged AAD Connector, Azure Active Directory Connector, Connector, FIM, FIM 2010 R2, Forefront Identity Manager 2010 R2, Help, Management Agent, O365, stopped-extension-dll-exception, Tip, Troubleshooting. Bookmark the permalink.